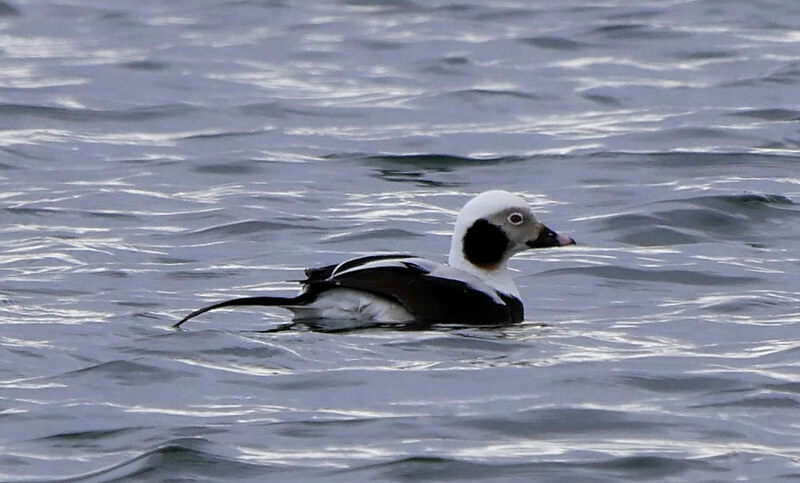 Based on a reported sighting we recently we found ourselves at Prairie Oaks Metro Park gazing intently out across one of the park ponds looking for Long-tailed Ducks. 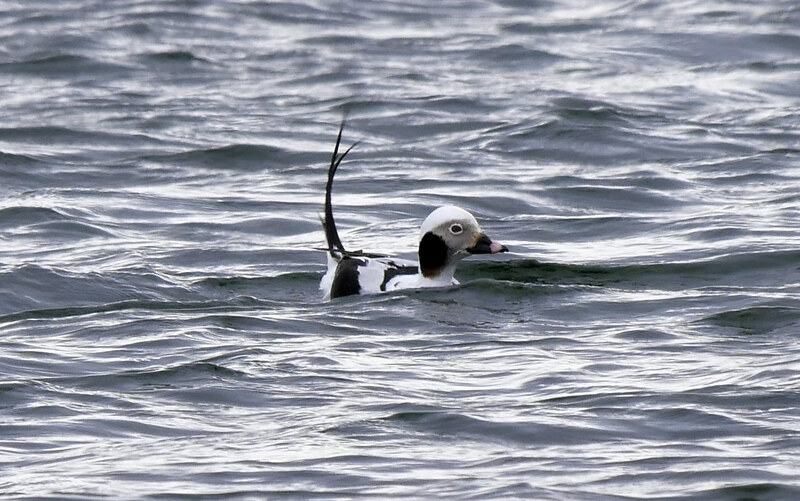 It’s a species that breeds in the far north and is otherwise usually found along the Atlantic and Pacific coast and if seen would be a new bird for us. After a tip from a fellow birder, and with the use of a spotting scope and binoculars, one bird was located without too much trouble. 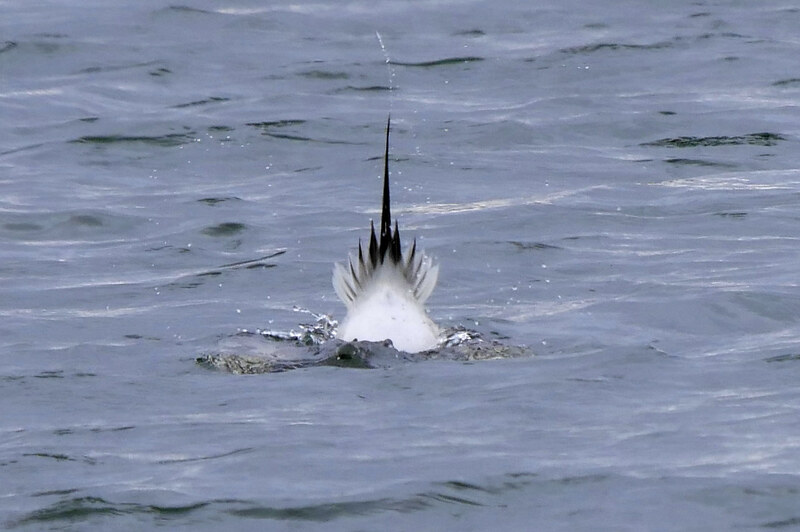 It must have found something to its liking in one particular location because after numerous dives it always surfaced in the same general area. While I enjoyed watching the bird’s behavior through the scope my wife did her best to get some shots despite the less than optimal light. My wife managed to get some shots showing the long tail. 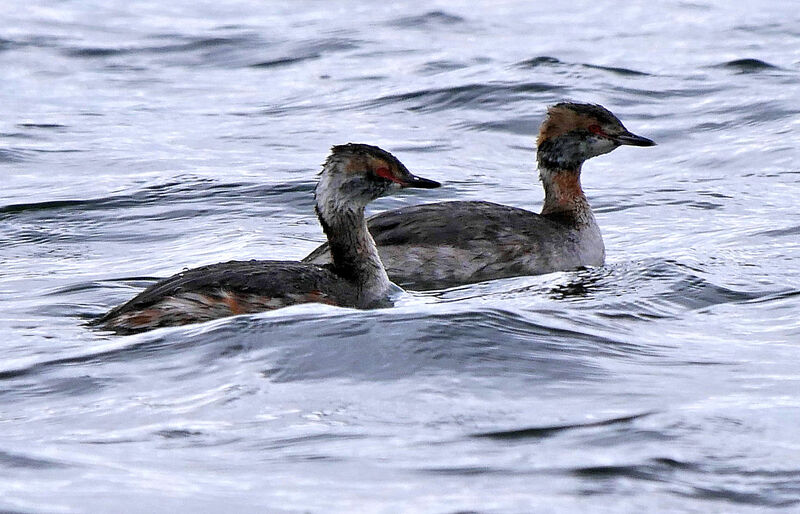 While observing the Long-tailed Duck a pair of Horned Grebes made an appearance. 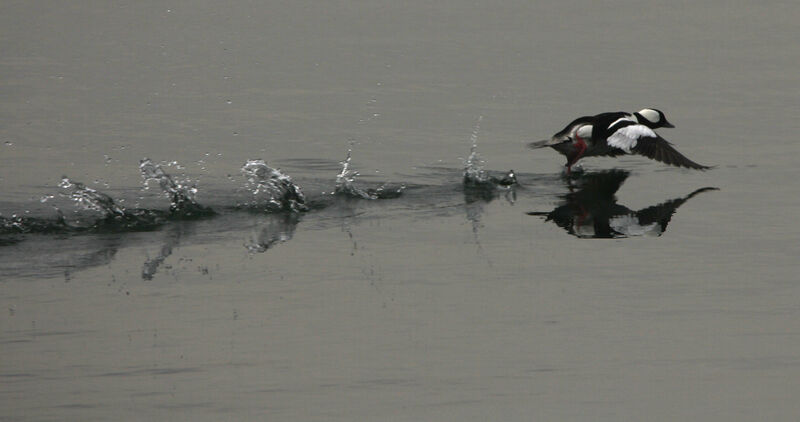 As a bonus just a day before while looking for migrating waterfowl a Bufflehead proved to be unusually cooperative. At least for a while . . . 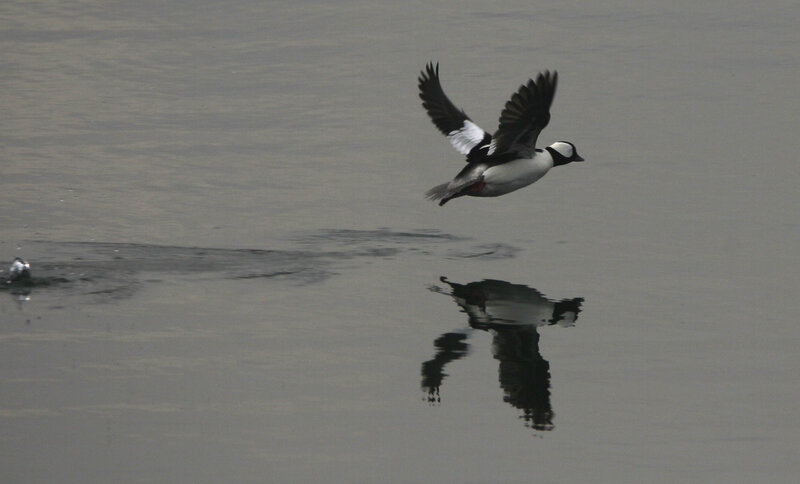 But as if the Long-tailed Duck wasn’t enough, the most magical moment may have been right after seeing the Bufflehead when a much smaller but no less charming bird appeared in a bush not far away. 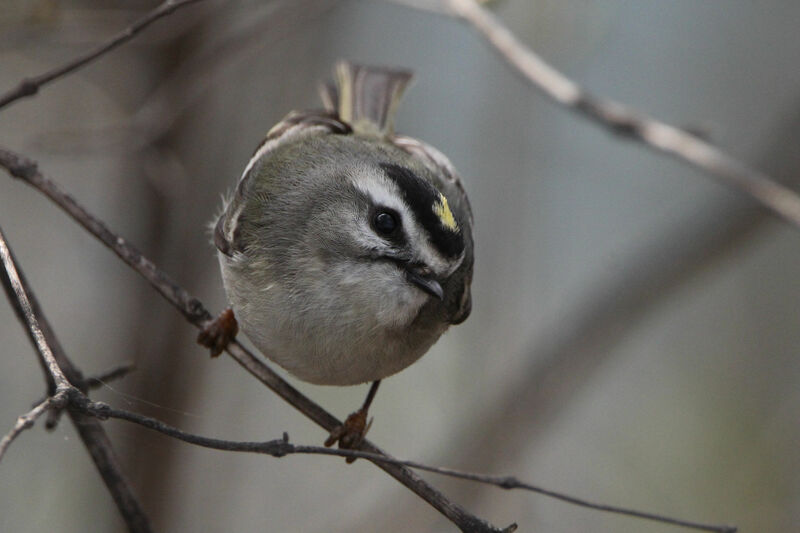 While it appears larger, the Golden-crowned Kinglet is about the same weight as a Ruby-throated Hummingbird. Too cute for just one picture. Several years ago we were paddling on a reservoir just northeast of our home when a Bald Eagle flew overhead. They were not all that common in central Ohio at the time. A few minutes later, hugging the shore, we entered small cove, and the very next bird we saw was a hummingbird darting from flower to flower. To see an eagle and a hummingbird in such close proximity in time and space left us in awe of the incredible diversity and beauty of birds. Thinking about what nature means to humankind and considering for a moment the size, shape, behavior, habitat, and abilities in just the world of birds stretches our mind beyond what we ever thought possible and I believe beckons us to hold all that is part of nature sacred. Yesterday we visited Highbanks Metro Park in the hope of seeing the Bald Eagles that nest in a Sycamore tree along the Olentangy River. The landscape, without a cover of snow, has become a sepia tone, especially if the skies are gray. Fortunately due to recent rains fungi were making a good showing. 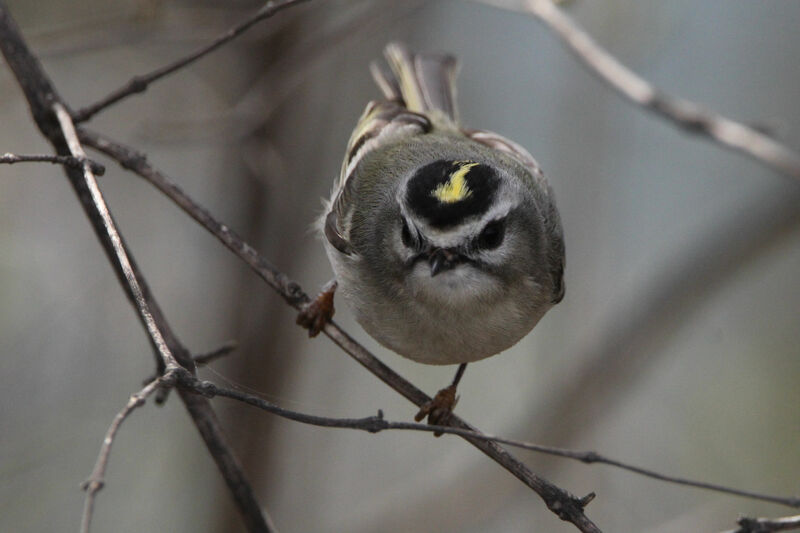 While we didn’t see the eagles, we were treated to sightings of numerous woodpeckers as well as nuthatches, juncos, titmouse, blue jays and chickadees. Pileated Woodpecker sightings made up for the absence of the eagles and this one, while not real close, did allow us to take it’s picture.
. . . and as mentioned above there were the fungi. Below are a few examples of the fungi seen. High Banks contains many mature trees creating an interesting picture when one falls. Finally, while walking in Griggs Park near our home, we continue to monitor the comings and goings of migratory waterfowl on the reservoir. My wife was able to get this interesting lichen fossil composition while I was enamored by the ducks. Our wish is that you will have a moment in the next few days to enjoy nature in your neighborhood. Thanks for looking in. This time of year I usually wake up before daylight. It’s a great time for reading and sometimes a little writing in the company of a candle’s warm glow and a cup of coffee. Yesterday morning, glancing out the window while the coffee pot was making it’s usual gurgle, hiss, and spurt noises, I noticed snow falling. If they hadn’t checked the forecast most would wake up to a surprise as, with no wind, it was happening very quietly. A light snow quietly falls in the morning darkness. Later, at first light, my wife got up and said, “What a great day for an adventure. We should walk down to the reservoir and see what’s happening and maybe, if nothing else, we’ll get some good snowy landscape pictures”. While she spoke snow continued to gently accumulate on tree branches outside our window. So after a hardy breakfast, we bundled up, and with cameras and binoculars in hand, set off on what turned out to be seven miles of exploration. I doubt we would have went that far, as slippery conditions meant it wasn’t easy going, except one interesting discovery was followed by another. The neighborhood the trees were putting on a good show. Neighborhood tree on a windless snowy morning. Things were just as snow covered when we reached the reservoir. A scene that would probably go unnoticed without the fresh snow. Thinking that we might find some birds along the river below the dam we headed south and were greeted by a landscape totally transformed. Path along the river below Griggs Dam. Tree roots under snow, Scioto River below Griggs Dam.
. . . and it was just as lovely further south. Pool, Scioto River below Griggs Dam. There were a few Mallards along the opposite side of the river but little else so we headed back north to take a closer look at what might be out on the reservoir. Our curiosity was rewarded. In defense of the following shots, sometimes it’s more about celebrating the discovery of a bird not seen before than the quality of the photogragh. Bonaparte’s Gull, a rare visitor to Griggs Reservoir. A bird we hadn’t seen before. We saw a number of Horned Grebes but the gull seemed to enjoy keeping this grebe company. Perhaps it was hoping to steal breakfast. A few other interesting birds completed the day. One of a number of sleepy Ruddy Ducks seen, Griggs Reservoir. Wishing you all the opportunity to enjoy nature in your neighborhood. Yesterday the air was cool, the sun warm, and there was little wind, so I decided to peddle the bike down to Watermark Quarries with the idea of enjoying the Loons one more time before they continued their journey north. I found myself feeling very content as I sat quietly on the bank, in the presence of the birds, looking. The Loons, along with a few grebes, and some other suspects, almost seemed to be looking back. We’ve been spending a fair amount of time the last few days looking for migrating waterfowl. However, a couple of days ago we did see our first warbler of the year, a Yellow-rumped, so it’s been a challenge deciding where to put our effort. All of the sudden it seems a though things are changing really fast. 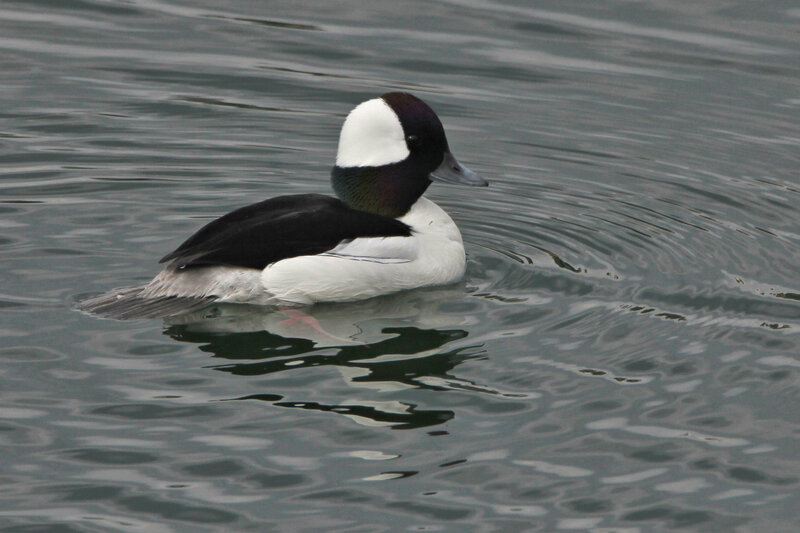 Yesterday while on Loon patrol along Griggs Reservoir Park , a Bufflehead stayed close to shore and posed as a Song Sparrow sang nearby. Song Sparrow along Griggs Reservoir, Certainly not a Prothonotary Warbler but with a song second to none! Today we visited Watermark and were fortunate to see Red-necked and Horned Grebes along with Coots, Canada Geese, Double Crested Cormorants and Buffleheads. The Grebes were of particular interest as we had hoped to see the Loon that had been reported at this location yesterday. As you may have guessed all the birds were pretty far away when photographed. Another stop was Kiwanis Riverway Park where we were excited to see our first turtles of the year on a log sunning themselves. You could hardly blame them as it was sunny with a temperature of about 75 F. While in the same area a Red-shouldered Hawk flew over with a small snake in it’s talons and landed nearby. How often does that happen? Close-up of the unfortunate snake.